Is your emergency survival planning on PACE? The spring outdoor season is upon us. The springtime is a great time to spend outdoors. The plans for your next outdoor experience are almost complete. Many survival experts agree that building redundancy in your gear and planning is essential to ensuring getting through an emergency. A simple method for building those layers is one that is from the military. The process for preparing and organizing your activities and gear is the PACE technique. PACE is an acronym for Primary (P), Alternate (A), Contingency (C), and Emergency (E). These are layers of redundancy to ensure essential capabilities are available at all times under any circumstances. The PACE technique applies to the different methods of survival: primitive, bushcraft, military, or blended. However, several questions must be answered before applying this method. First, you need to answer the five W’s of your outdoor activity: who, what, where, when, why, along with how. Next, you need to assess your level of experience and knowledge: beginner, intermediate, or expert. Additionally, you should also evaluate the level of experience of others. This should be done especially if you are accompanying or leading a group. You should know yourself and those in your group. Furthermore, each member of the group needs to be aware of the level of experience of the other members of the group. Also, you and each member of your group should know what everyone else is carrying for gear. Thus, it is wise to share each other’s packing list. Third, assess your critical capabilities supporting the activity: first aid, navigation, communication, security? The definition of critical capabilities are those assets that you or your group possess that if lost would jeopardize the survival of yourself or others. Consequently, that means having a good understanding of yourself and your gear and those of the others in your group. If you are in a group, one technique would be to share each other’s packing lists. Fourth, you need to determine the type of terrain and local weather characteristics. It is crucial to survival planning to know where you are going, what time of the year you are going, and what are the patterns of weather where you are going. Others have found themselves in emergency survival situations due to unexpected weather events, such as flash floods. Consequently, they were underprepared for the scenario. Thus, take the time to really understand the historical, current, and projected weather of the location for your outdoor activity. For example, many people have reported their surprise at how cold the desert can get at night in the spring. Finally, you should understand the availability and access to emergency assistance near the planned activity site. One of the quickest ways to resolve an emergency survival situation is having a basic knowledge of the support available at your location and how to access it. There was a recent story of a teenage boy who ran almost six miles to a park ranger station to get help for his injured father. The young man could not do that if he did not know how to get to that ranger station. The key to survival planning is gaining situational awareness to better PACE yourself. For the purposes of this article, the capability that will model the PACE method is communication. However, the PACE method applies to any asset or ability that you assess as critical to the success of your outdoor adventures, such as making a fire, rendering first aid, building a shelter, food procurement, or water processing. Therefore, for this hypothetical outdoor scenario, forms of communication are a critical capability that cannot be lost or activities will cease or lives will be jeopardized. An example of a primary means of communication is a smartphone. Smartphones are becoming more sophisticated every year. They come with a variety of domestic and foreign plans, as well as applications. Many smartphones can function as satellite communication devices in an emergency where there is no commercial wireless coverage. The implied tasks for keeping a smartphone running in the outdoors is to maintain wireless coverage and to charge the battery. Thus, an essential capability for smartphone use in the field is the ability to keep charging the battery with a solar powered charger. An alternate form of communication in the field is a hand-held radio (HHR). A hand-held radio is also known as a walkie-talkie. HHR devices come in many forms. These radios can transmit and receive voice communication over a limited distance. However, for communicating with an HHR over an extended range, the ability to relay signals through a repeating tower come into play. As with the smartphone, keeping the battery charged on an HHR in the field is also essential. The definition of contingency is a provision for an unforeseen event or circumstance. Thus, for survival planning a contingency communication asset may be a Garmin® inReach Mini or a SPOT™ Gen 3 device. These devices are for sending out emergency text messages through a satellite service with geo-location information to help first responders find you. These items are almost a last resort communication device if the smartphone or HHR radio goes down or is lost during an emergency survival situation. An emergency communications capability is an asset that is for when all of the previous devices malfunction, get broken, lose power, or become lost. An example of an emergency communication capability might be a signal fire, signal flares, signal mirror, air horn, or a signal panel (VS-17). Therefore, an emergency signal capability could be any method that you can employ to communicate to others your location or whereabouts. The PACE method is a valuable method to help you think through maintaining essential capabilities while outdoors. There is no right or wrong solution to determining your critical capabilities. Each outdoor activity is different. Therefore, the needs will be different. For example, a day-long fishing trip to a nearby location will be different than a hunting trip to Alaska. The same is true for preparing for emergency disasters. The survival needs for my area and family will be different than for those living in the upper Midwest. Thus, the PACE method helps you to think through the preparedness process and to resource your needs. 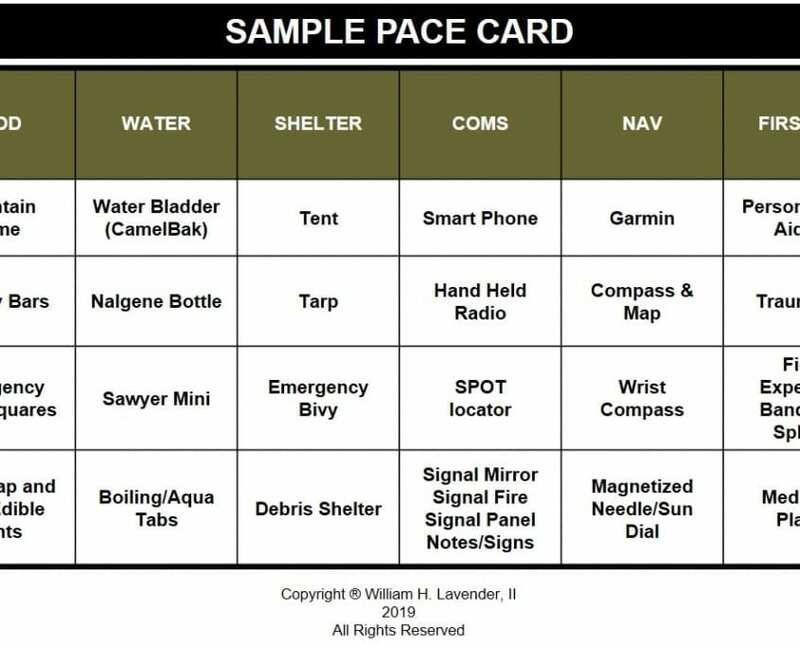 https://survivalschool.us/wp-content/uploads/2019/04/survival-planning.jpg 1126 2000 Bill Lavender https://survivalschool.us/wp-content/uploads/2018/05/inner_header_logo.png Bill Lavender2019-04-04 19:35:512019-04-04 19:35:51Is Your Survival Planning On PACE?